With each issue I fall deeper and deeper I love with this book. If you haven’t been reading this or even realised it’s on stands you really should rectify that as soon as humanly possible. At first glance it appears to be just another kids book, looks cute on the surface and unfortunately easily skipped. However Hex left his family in the midst of an eternal war with their mortal enemies to come learn real, powerful magic then to return to his family, well that was the plan anyway but when dealing with his uncle and his friends nothing is ever going to be easy. 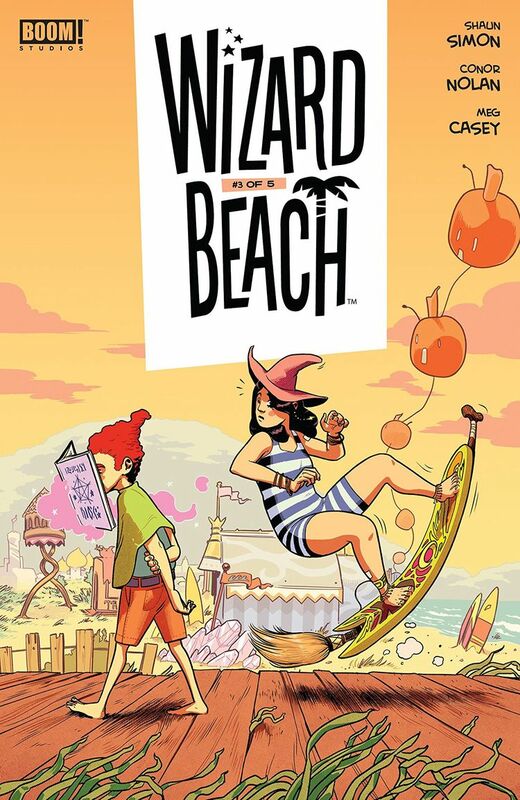 The story is incredibly delightful and regardless if your a wizard (Harry) or not this is the kind of coming of age story that is as good as any I have ever read. I mean not surprisingly I think of Judy Blume when I think of this story, sure it’s fantasy but it’s more about learning about who you are than anything else and that well as I recall was a speciality of hers. So while Hex tries to figure out ways to learn and leave the beach there are those that surround him who may not only change his mind about leaving but about how to live life as well. I am a huge fan of how this is structured. These chapters lend itself to a book style feel that is great for those parts of the story that tie-in but are separate entities. Like the first chapter here which is full of surprises that keep the reader on their toes and honestly for me anyhow seemed to have come out left field. Though now I am beginning to see more and more how this first chapter ties into a few other odd happenings and that makes me an even happier camper than I was expecting, and the bar the was already pretty darn high. I am enjoying the interiors like no ones business I mean they are just so damn cute and all of it seems to fit like a masterpiece. The linework is spectacular and the way it’s used to create all the attention to detail is so well done. The creativity and imagination on display here is beyond what one could or should hope for and that’s part of the charm that this series has. I mean seriously a little demon type creature who’s been living n Sal’s beard all this time, Frost Giant tattoo artist and a plethora of other unique creature characters inhabit this world. The mind to create all this it just thrills me to no end. The utilisation of the page layouts and how we see the angles and perspective in the panels shows off a very good, strong and talented eye for storytelling. The quality of the backgrounds we see is marvellous and definitely makes me want to see more. Also the colour work here is just perfection. This beach that’s part of two worlds and yet still oddly isolated is one of the most interesting places I have ever been and one of those places I would kill to visit. It isn’t very often that we are privileged to find a story that combines everything we know, packaged in such a way that it showcases all we have seem to conveniently forgotten. This is what kids should learn and adults should remember and it’s just one of the purely delightful books on stands right now.